This is a full-year (spans 2 terms) returning class. It was previously offered during the 2011/12 and 2012/13 school years. While it is not a canon class, the material it covers is mostly the one JK Rowling has provided through her books and short stories (on Pottermore). We will cover every detail about this magical place, from its grounds to its tallest towers. To learn more about the class itself, please see the Syllabus! 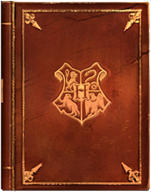 Hogwarts: A History is a book written by the famous magical historian, Bathilda Bagshot. While the lessons for this class already contain all the material we will cover and we won't be using any outside resources, you could say the book itself is our required textbook. Or you can see this class itself as a short version of the detailed information included in this particular book. Either way, the class and the book share the same topic, and for the most part it seems they share their content as well. One particular difference is the fact that Bagshot's Hogwarts: A History seems to avoid the uglier/nastier aspects of the school's castle. While it includes a lot of history and facts you likely won't find anywhere else, it tends to skip anything which does not suit the author. Which should not be taken as an offense on Bathilda herself, but a simple clarification of accounts. For example, she does not mention the use of House-Elves at Hogwarts at all, when in fact they're the driving force behind the scenes. Still, for those interested, the book is quite entertaining and I can only suggest you get yourself a copy to read in your spare time. All material related to Harry Potter is © J.K. Rowling, Scholastic Books (US), Carlsen Verlag (D), Bloomsbury Publishing (UK), or Warner Bros. This site is unofficial, non-commercial, not related in any way to any of the above people or companies, and it is used solely for entertainment and learning purposes. Lessons and assignments © Prof. Zoki Phantom 2011-2018.